I've really been enjoying following along with everyone's posts for Slow Fashion October. It's been a really inspiring month, and I'm not ready for it to be over! Though I am more than ready to be done with taking daily pictures. :) SFO made me realize that while there are still a few things that I need to sew to fill gaps, I'm in a good place with my handmade wardrobe. 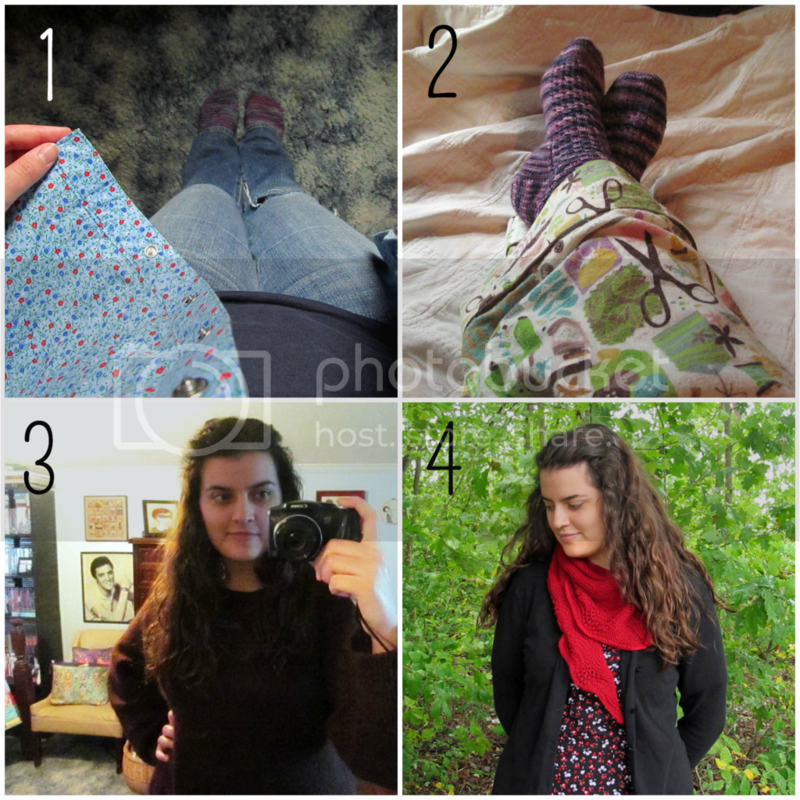 It wasn't difficult for me to wear something handmade each day (counting knitted items helped, too). Day 26: On Monday, we took our yearly drive to the mountains. We go to the same places every year, but I always look forward to it. My parents have been taking pictures at these rocks at Rocky Knob since I was a toddler, ha! It was cold, so I wore my Lady Marple cardigan (which feels huge and ill-fitting now compared to my new sweater). I also wore my black polka dot Renfrew and this cowl. Day 28: This shirt and my second knitted socks (much darned and rather ugly, but still warm and wearable!). Day 30: This shirt again...I'd forgotten that I just wore it on Wednesday! Day 31: I guess I subconsciously decided to dress as a pumpkin for Halloween. :) The only handmade item I wore was my green Nurmilintu shawl...the orange sweater-ish shirt came from Target at least four years ago. I haven't purchased a lot of yarn or fabric this year, but one of my goals was to focus on buying American-made supplies whenever possible. As Karen mentioned, yarn is the easiest. 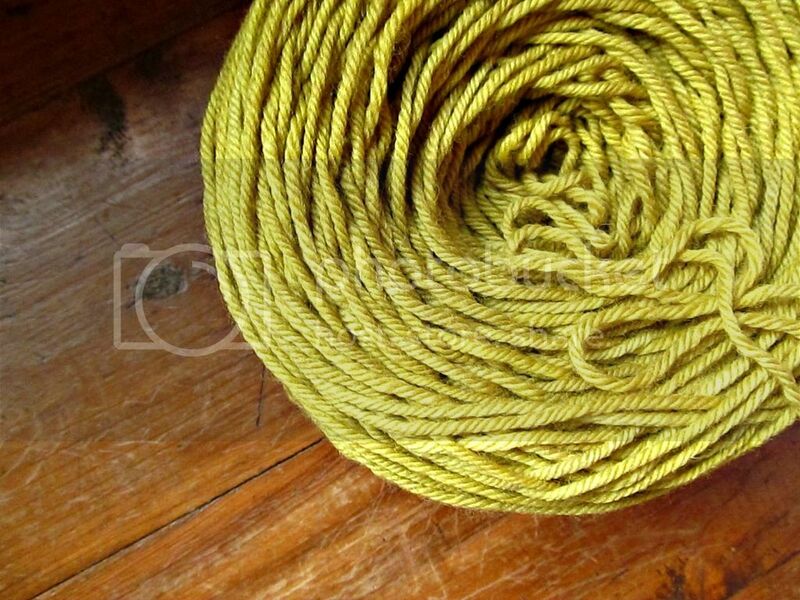 Things are really improving in the fiber world right now, in regards to being able to know where your yarn comes from. Having said that, most of the yarn I own is from KnitPicks and other not-very-traceable sources. I'm knitting through my stash (which is currently the smallest it's been in a couple of years, and I'm really happy about that! 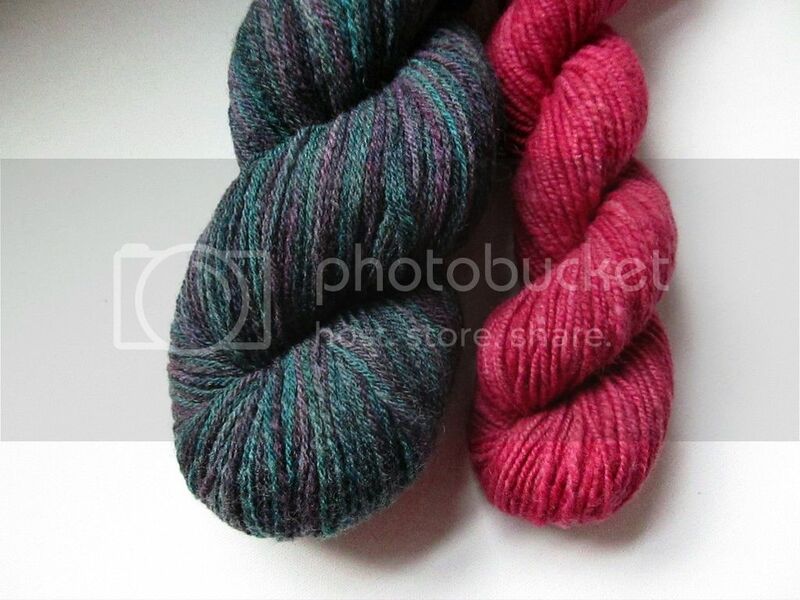 ), but when I do buy yarn, I'm trying to be more selective. 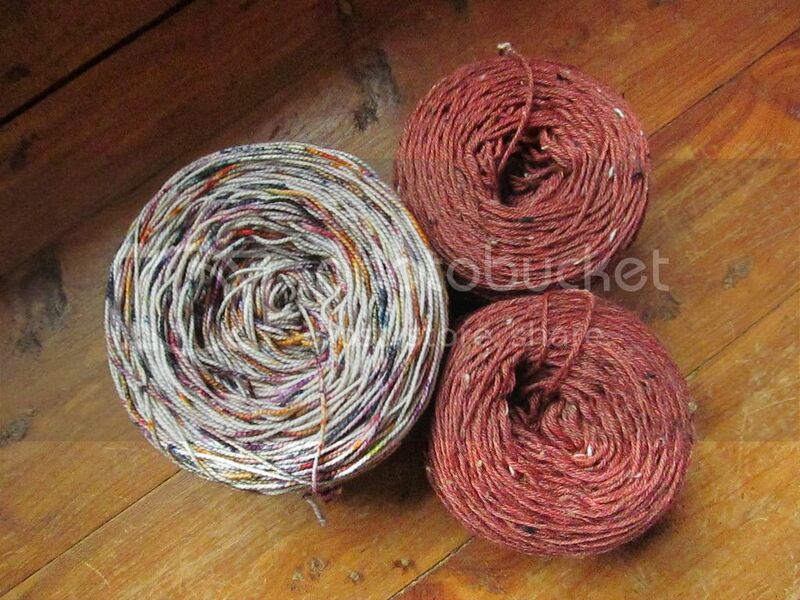 Shown above are the yarns in my stash that are the most traceable. 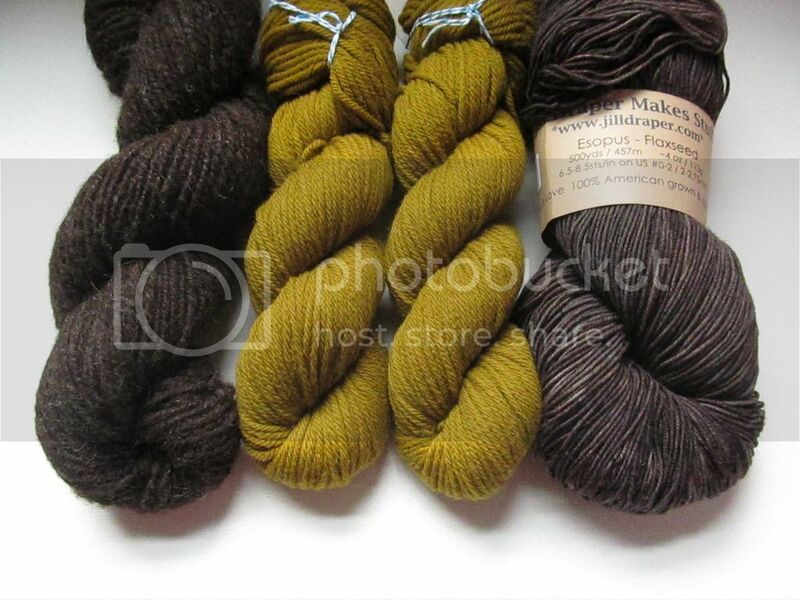 In the top picture, I have some Finn/Jacob handspun made from incredibly local fiber (less than an hour away). There are also two skeins of Quince & Co. Lark (US wool), and a skein of Esopus from Jill Draper Makes Stuff (100% American grown and spun). In the second picture, there's a skein from Tale Spun Yarns that I bought on our weekend trip to Tennessee in the spring...I am so excited to make socks with this yarn! It's a blend of Corriedale and Rambouillet wool and nylon: the wool was raised in Tennessee, the yarn was spun in an American mill, and it was hand dyed in TN. 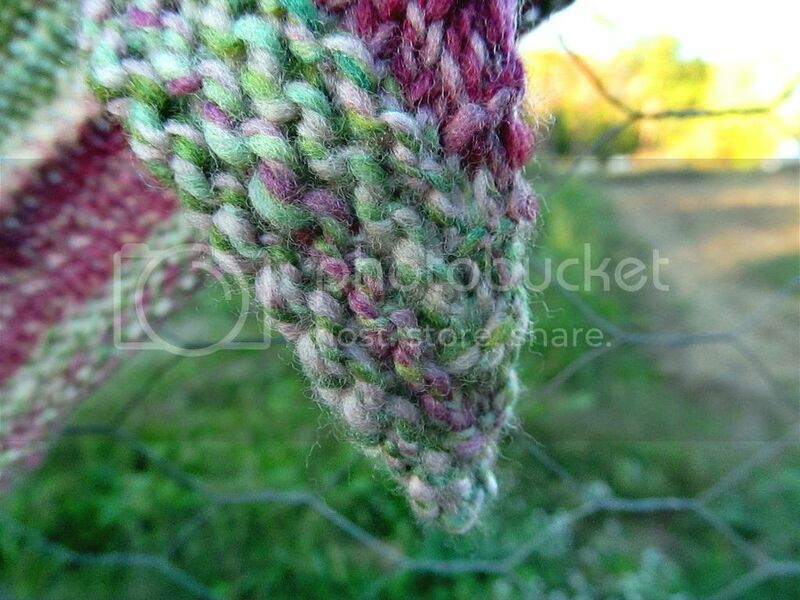 And finally, there's the pink yarn. It's from some raw Cheviot fleece (raised in the US) that I scoured, hand carded, spun, and dyed naturally with pokeberries. 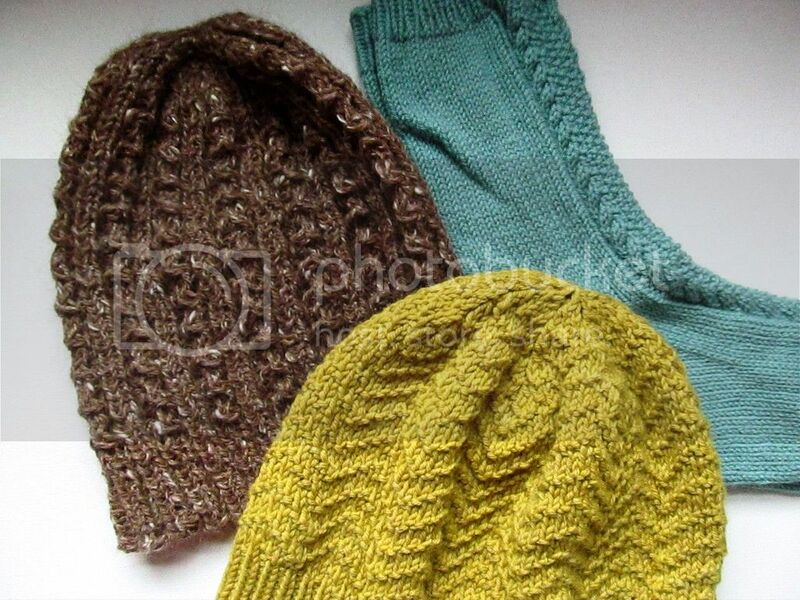 In the third picture are my only knitted items so far made from traceable yarn: my Irish Oats socks (made from Quince & Co. Chickadee), an alpaca hat (Rooted yarn- the alpacas were raised here in Virginia and the yarn was spun in North Carolina), and my recently finished FreshMint hat (knitted from organic Merino, naturally dyed by Liesl). 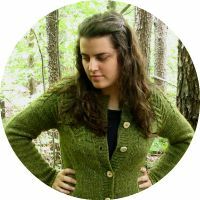 There's a really good list of yarn sources on this week's post at Fringe Association (check the comments, too). There's also another list here. Two American companies that I'm planning on purchasing my next sweaters' quantities worth of yarn from are Bartlett Yarns and Beaverslide. But fabric? That's another story. It seems almost impossible to find out where fabric is made, and under what conditions. So far the only luck I've had is with Girl Charlee. Almost all of my t-shirts are made from jersey fabric that I've bought from them, and they carry some fabric that's made in America. (There doesn't seem to be any way to search for that...you just have to look at the listing for the fabric you're interested in to see if it has the American made emblem.) If you're making jeans, you can find fabric from Cone Denim Mills online (here and here, for example), and it's made in North Carolina. Other than that, I haven't been able to find any fabric in my price range that clearly states where it's made. You can find some organic cotton online, but it's usually made in India, so you have to decide what's more important: organic or American made. 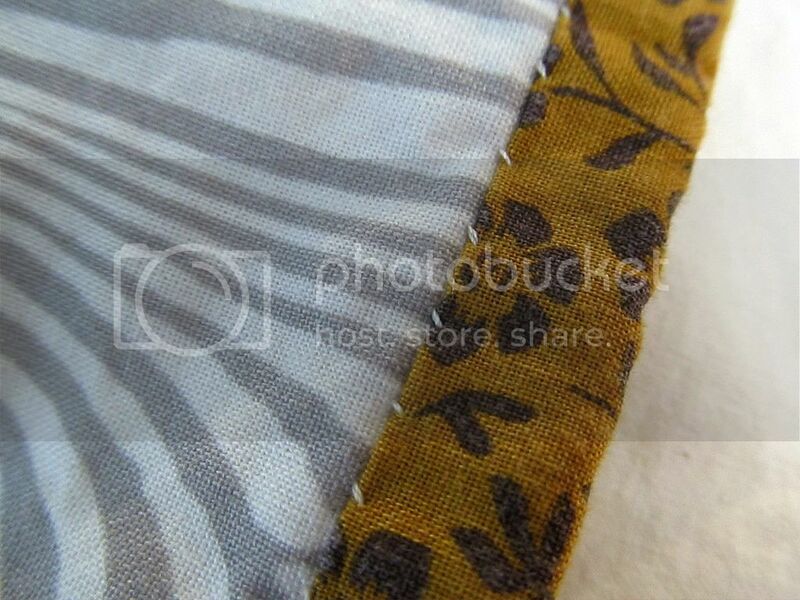 If anyone has any more fabric recommendations, I'd love to hear them! As for reference books, films, and videos, I feel like most people who are interested in slow fashion already know about the ones I'm going to mention, but I'm going to recommend them anyway. :) Elizabeth L. Cline's book Overdressed: The Shockingly High Cost of Cheap Fashion is a great starting point. I've also heard amazing things about the documentary The True Cost, though I personally haven't been able to see it yet. There are a few videos online that are definitely worth watching: Unravel (a look at just how much we waste, and how some of our castoff clothing is being recycled into thread in India), The High Cost of Cheap Clothes (how women in Cambodia are choosing prostitution rather than working in garment factories), and Sweatshop: Deadly Fashion (a subtitled five-part series where Norwegian teenagers who love fashion visit garment factories in Cambodia). Day 19: I wore a teal Renfrew and my Downton Cowl. Day 20: I mentioned in my Loved post that I wear this cowl all the time, and here's the proof. It matches with everything. :) I also wore a long-sleeved striped Renfrew. Day 21: And yet another Renfrew appearance. I wore my first one again. Day 22: I wore this red shirt, and I finally mended the knee of those jeans. Day 24: I had a craft fair and spinning demonstration on Saturday, and it was the first day this month I forgot to get a picture of what I wore! My mom took a few pictures with her camera, but I have no way of getting them on my computer. Anyway, I wore a purple Renfrew under my antler cardigan and my handspun shawl. Day 25: I wore my second swing dress to church. I prefer the fabric of this one to my first one, but for some reason I still tend to wear the first one more. This week's topic is the one that I don't have much to say about. It's not that it isn't important, it's just that I don't have a ton of experience with these things. While I love the idea of shopping secondhand, I've never had much luck with finding clothes at the thrift store. Books? Yes. But not clothes. I don't know whether it's because I'm an odd size or that I just can't find clothing that I like in our area stores. And as for mending...well, I'm trying to get better at that. I have a few things (mine and my parents') that have been sitting in my sewing room, waiting to be mended, for over a year now. Again, I'm not sure why this is a problem for me! I love the idea of mending, but I'm not very good at hand sewing so I seem to put it off. 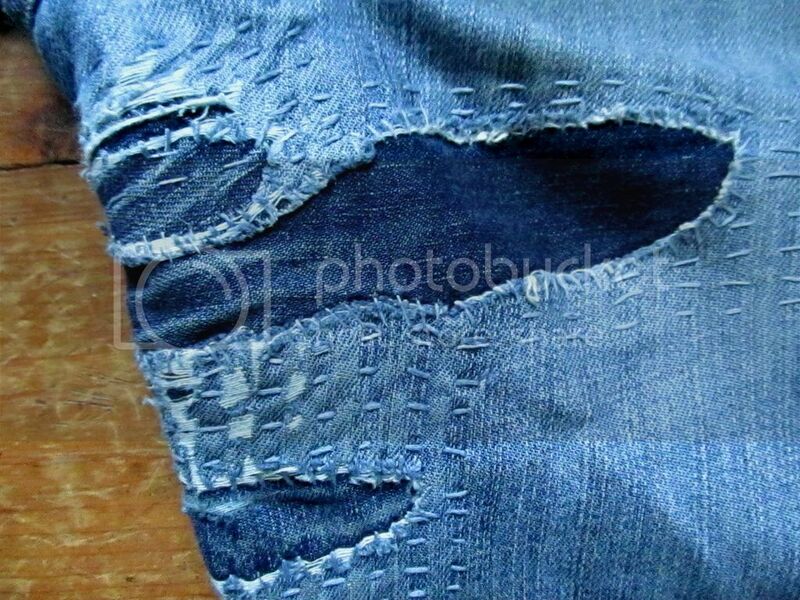 I took some time this week to patch a hole at the knee of my oldest jeans. They're definitely my most-patched item of clothing, as you can see, and I don't leave the house in them anymore, ha. I used to try mending them in a more subtle way, but it was always visible anyway, so that's when I embraced the idea of "visible mending." :) It turns out that it's a lot more fun to use different colored thread and fabric to mend instead of trying to make the patches as inconspicuous as possible. (Though when it comes to patching clothes that I do still wear in public, I'll make more of an effort to be a bit neater.) 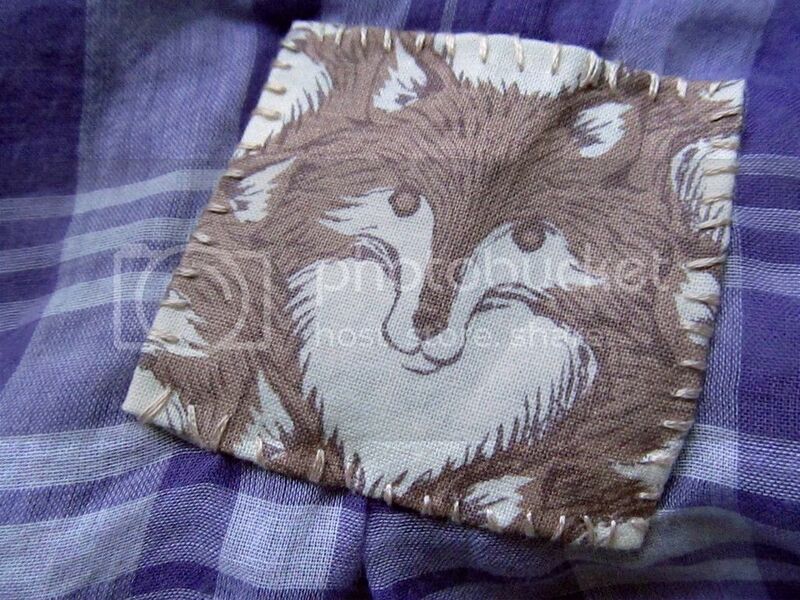 I also added a little fox face patch to cover a hole in a cotton button up shirt...because why not? I want to learn more about caring for my clothes to make them last longer, but as it is now, I definitely wear things until they're completely worn out. When I was little, we had two categories of clothing: good clothes and everyday clothes. We wore our good clothes to town or school or church, and our "everyday clothes" were basically play clothes. I still use that system. When I make or buy something new, it's "good." When those get a little too ragged to be worn in public, I wear them at my babysitting job. (I keep my cousins' kids, and as we're outside a lot, dressing nicely doesn't make a lot of sense.) And when it gets to the point where I'm embarrassed to wear them while babysitting, then they become everyday clothes and get worn around the house, outside, etc. Because I'm at home a lot, my good clothes don't get as much wear and last for a long time, but my everyday clothes are the ones that need mending. You can read this week's post at Fringe Association here. 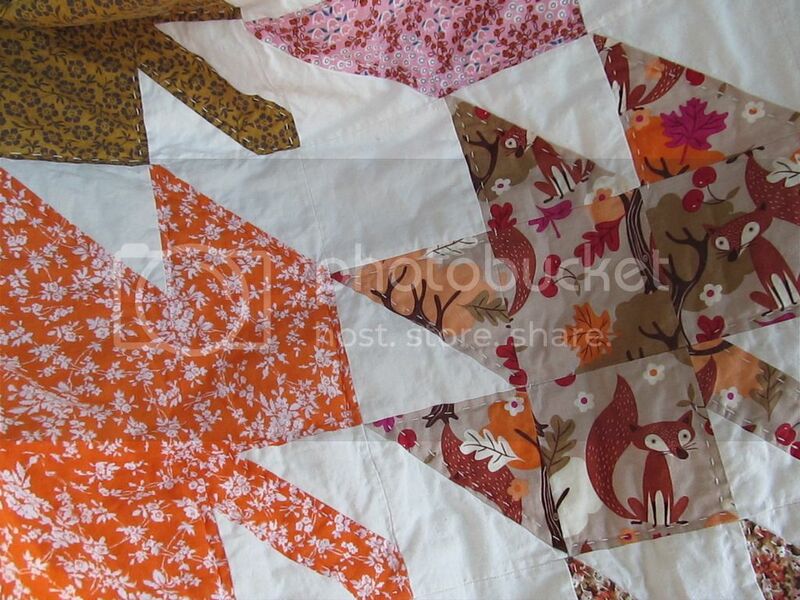 The pattern is called the Modern Maples Throw Quilt, and it's from this adorable little holiday patchwork book. (But it's also available to download for free here, if you're interested.) It's designed by Amanda, who was one of my favorite bloggers and the reason I got obsessed with knitting socks, though she doesn't blog much anymore. The pattern was easy enough to follow...this was my first time doing any sort of piecing other than just plain squares, but it was still fairly easy. And it turned out to be a good size (I didn't measure it, sorry!). It's a throw quilt, and it covers most of the top of my queen sized bed, so it's plenty big enough to curl up under. I think all of the fabrics on the front are quilting cotton from Joann's. I was originally planning on doing a gray background, but with the prints I chose for the leaves, this natural cream/white Kona cotton was a better match. 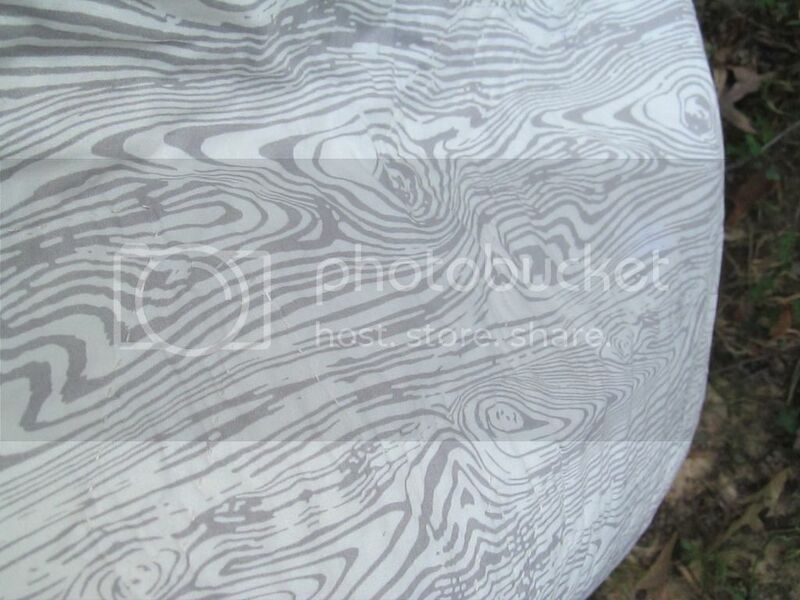 The fabric on the back (which I had to piece together) is a white and gray woodgrain print from Hobby Lobby, if I'm remembering correctly. 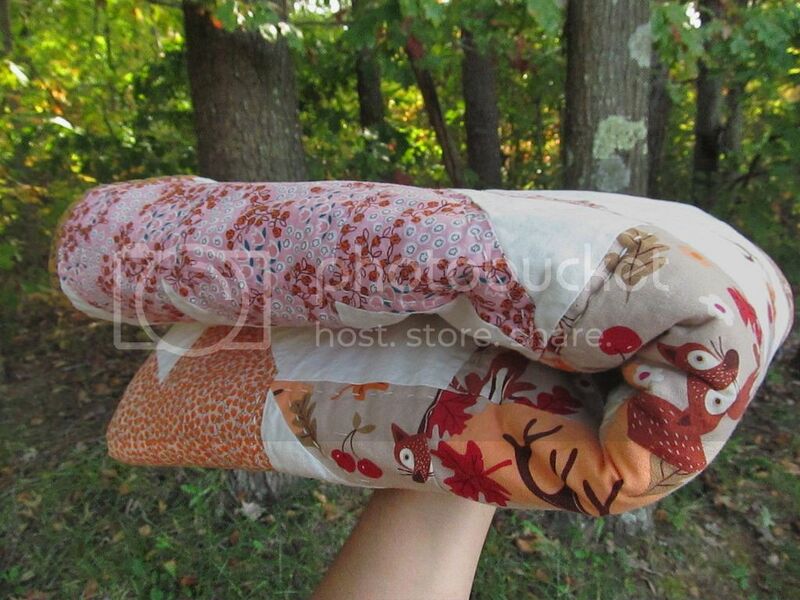 I used the warm and natural quilt batting. Even though I'm really bad at hand sewing, I've come to realize that the only part of making a quilt that I enjoy doing on the sewing machine is the actual piecing and making the quilt top. I hate machine quilting! Between my ornery walking foot and trying to wrestle a huge quilt around my little machine, I'd much rather just hand quilt it, though it obviously takes longer. I used perle cotton to quilt this one...I just went around the inside of the leaves, about 1/4 inch from the edges. 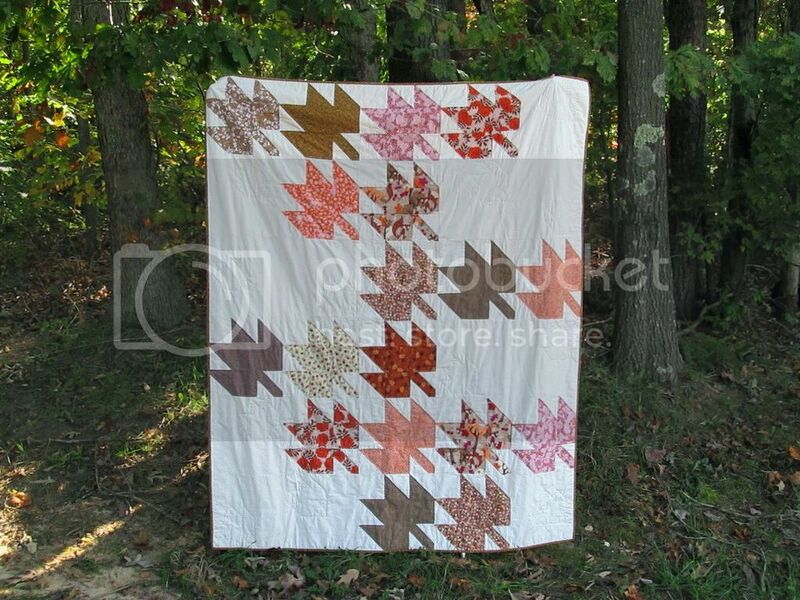 In the plain white squares, I ended up quilting one small leaf in each square, positioned randomly. It's pretty subtle, which is what I wanted. I have this bizarre fear that if I have kids and grandkids, they won't appreciate handmade for some reason, and all of the things I've made over the years will eventually end up in Goodwill. 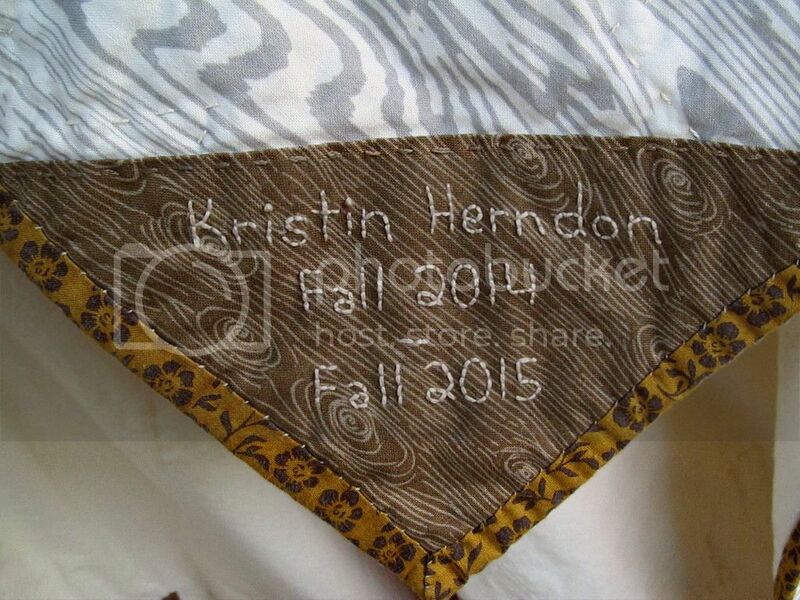 I always add a little label to my quilts with my name on it, so if my fears do come true, at least the kid or grandkid will feel a twinge of guilt at the awful thing they're doing, right? :) It's been a long time since I've done any embroidery, so my skills were a little rusty on this one. P.S. 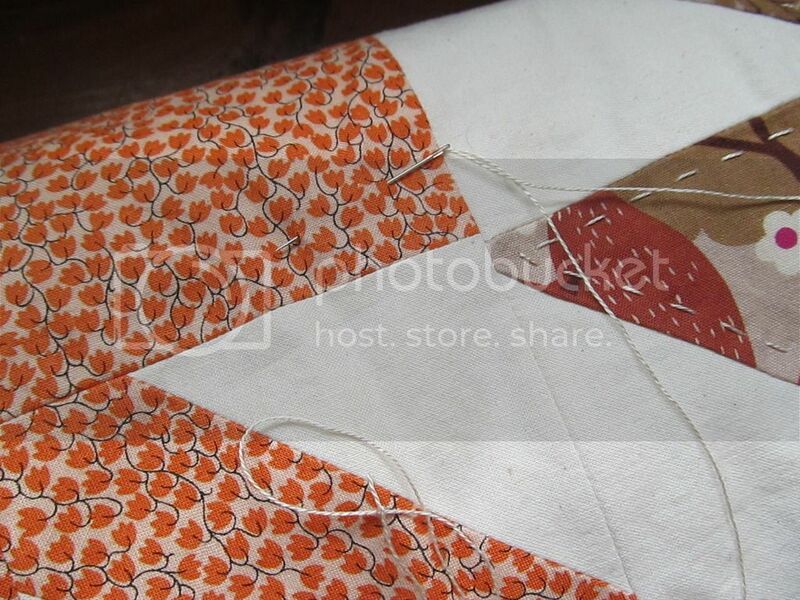 Am I the only one who gets a weird sense of enjoyment from binding a quilt? I don't know why, especially given my dislike for hand sewing, but sewing the binding to the back is one of my favorite parts of making a quilt! 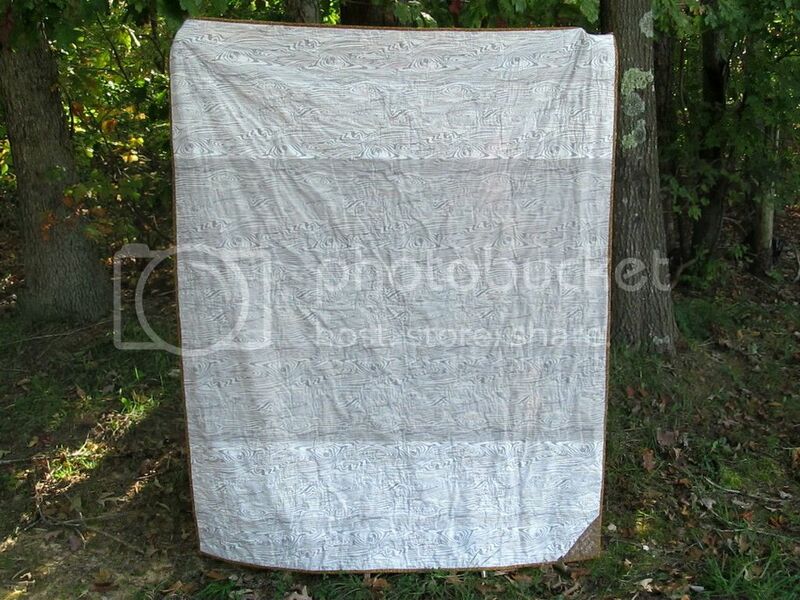 Second only to that feeling when you pull a quilt out of the dryer for the first time and it's all warm and wrinkly. That's magic. In the fall, I tend to gravitate towards certain movies. Not necessarily Halloween movies or "scary" movies, but ones that are sort of atmospheric. This month I've watched some that I'd never seen before, and while I didn't have enough to say about them to write full reviews, I thought it might be fun to mention them here. 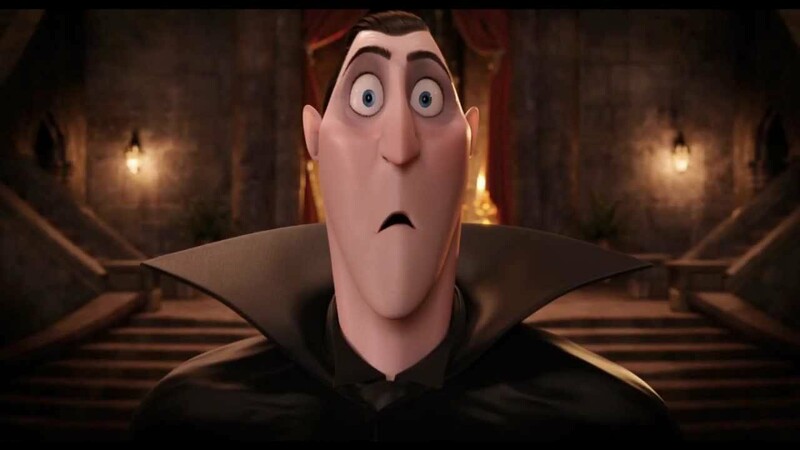 Hotel Transylvania. This one was just okay. I liked seeing the spoofs of classic monsters, but honestly, Pixar makes such amazing films that they've ruined most other animated films for me. They just never measure up! Dracula. 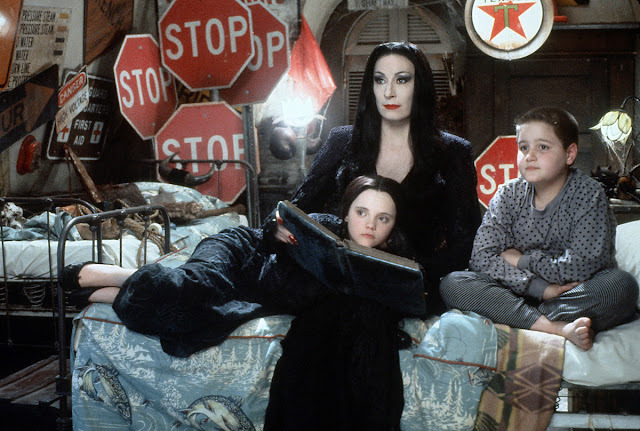 I love old movies, but I feel like I'm lacking in the area of classic horror films. I watched the 1931 Frankenstein (and the Bride of Frankenstein) a couple of years ago and I caught The Blob last year on TCM, but that's about it. So a couple of weeks ago I watched the 1931 Dracula, and wow. It was entertaining and hilarious, but not the least bit creepy. (I guess I shouldn't have expected it to be. I'm a scaredy cat and don't watch truly scary movies. But I can't see how anyone could ever watch this, even back in the 30s, and be scared by it.) 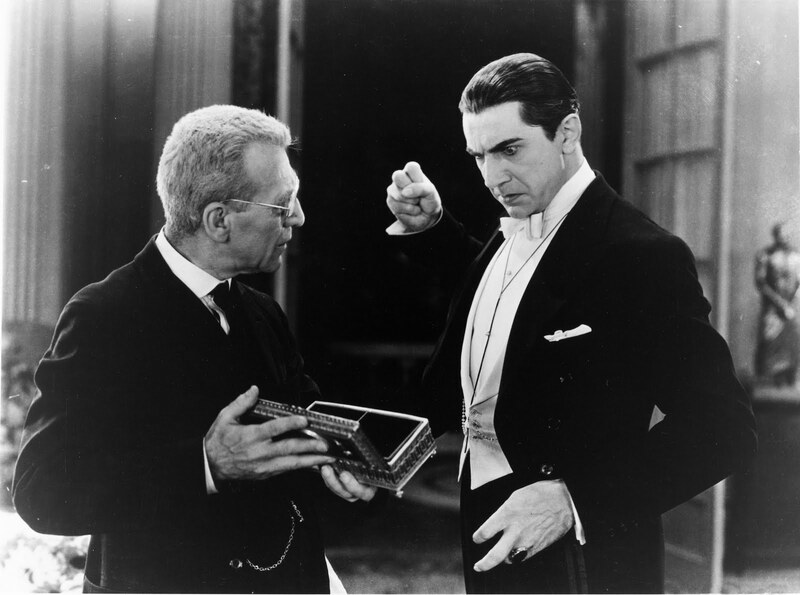 Bela Lugosi was so dramatic and over-the-top that it cracked me up. My favorite part was how they shined light on his face to give the appearance of his eyes glowing when he was mind-controlling people. At least I think that's what they were going for. The Addams Family. This one probably isn't very good, but I love it because I grew up watching it and it makes me feel nostalgic. And honestly, I much prefer it to the TV show. The humor and kookiness of it always makes me smile. The 39 Steps. I watched the newer Persuasion again recently (it didn't make this list because I'm rereading the book and planning a post about both), which stars Rupert Penry-Jones. 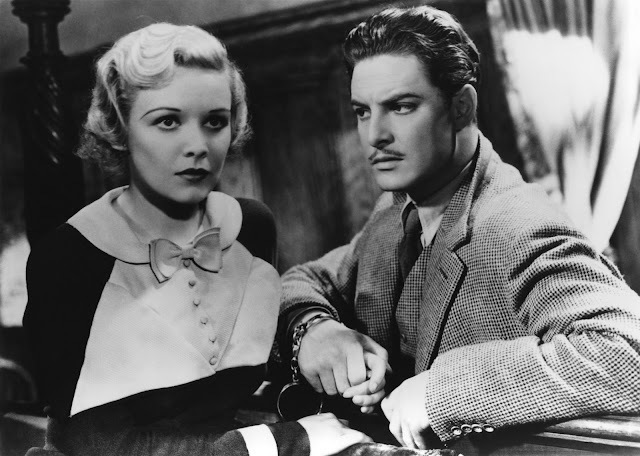 That reminded me that I wanted to see him again in The 39 Steps, which reminded me that I wanted to watch the Alfred Hitchcock film before watching the remake. The 1935 version was pretty good. It was intriguing and I wasn't sure what was happening (I haven't seen the remake since it came on PBS, so I couldn't really remember the plot). But as far as Hitchcock films go, it wasn't particularly memorable or one of my favorites. The Age of Adaline. This movie doesn't really fit in with the fall or Halloween theme, but I was reminded recently (by Rissi) that I had wanted to see it when it released on DVD. I enjoyed it more than I expected to! It was a very quiet film, and much sadder than I expected. (Particularly the whole aspect of Adaline being "younger" than her elderly daughter. And the dog part, because why is it impossible to even have a dog in a movie without it ending in heartbreak??) 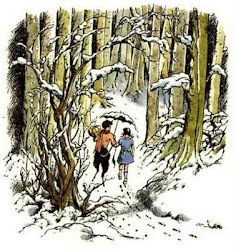 The whole basis of the plot was interesting (definitely reminiscent of Tuck Everlasting, one of my favorite books), and despite the annoying narrator, I really liked it. 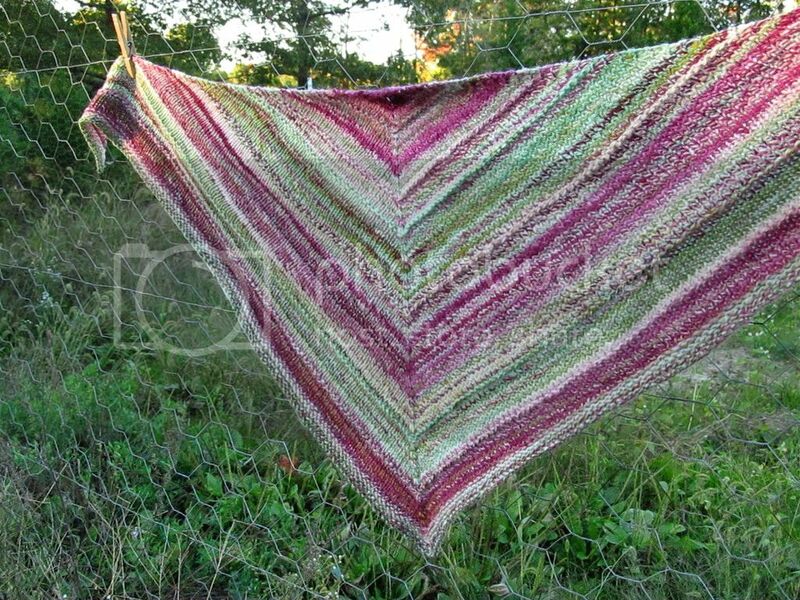 This shawl was one big surprise. When I spun the yarn, I was surprised by how much yardage (292 yards) of incredibly soft, squishy yarn I got from four ounces of Merino fiber. I was surprised that I found myself casting on for a shawl within a couple days of finishing the yarn. 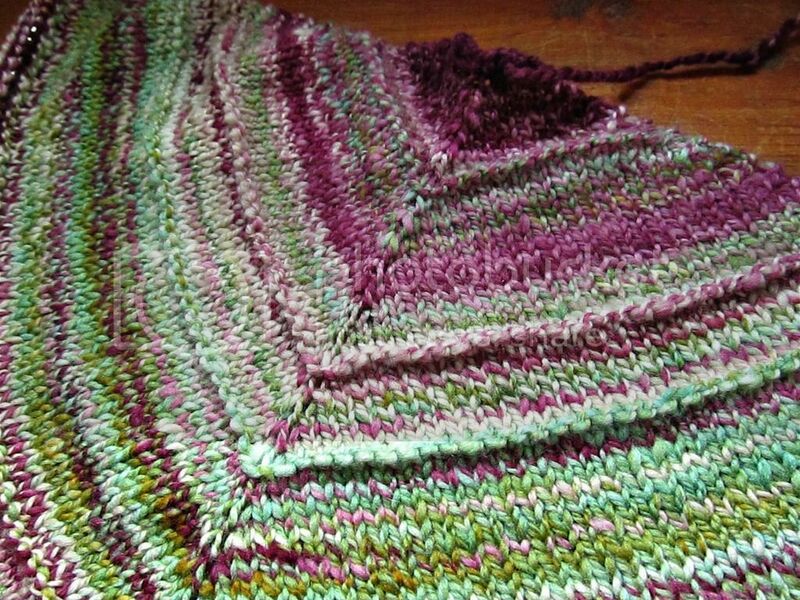 I really should have been knitting other things, but working on the shawl was so addicting. I was surprised when, less than a week after casting on, it was finished. And when I blocked it, I was surprised by how large it turned out (about 20 inches deep and 51 inches from end to end). So I probably shouldn't be surprised that this is one of my favorite things I've knit from my handspun. I just really love how it turned out...soft and warm and striped and larger than I expected. It doesn't even bother me that the purple-ish shades almost veer into pink (and as I've mentioned before, I'm not a fan of pink). 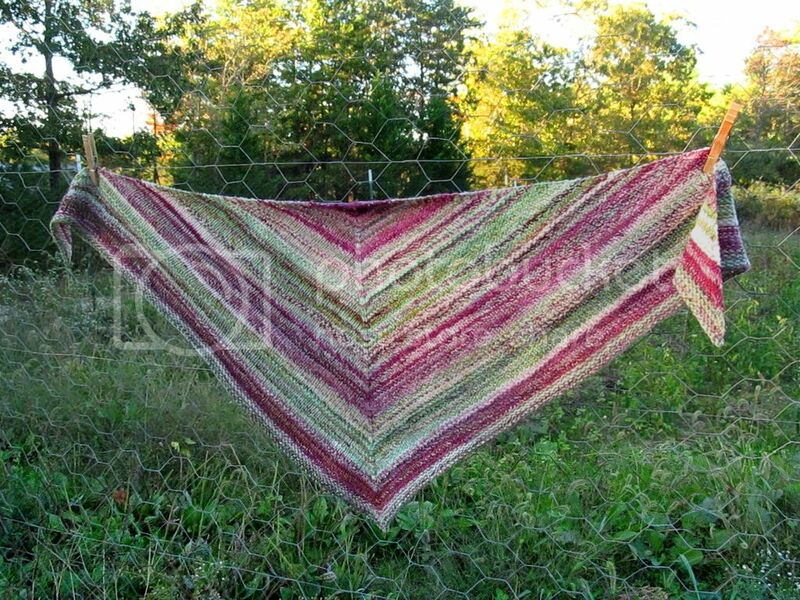 I used the Boneyard Shawl pattern, though I didn't count rows between each garter ridge. 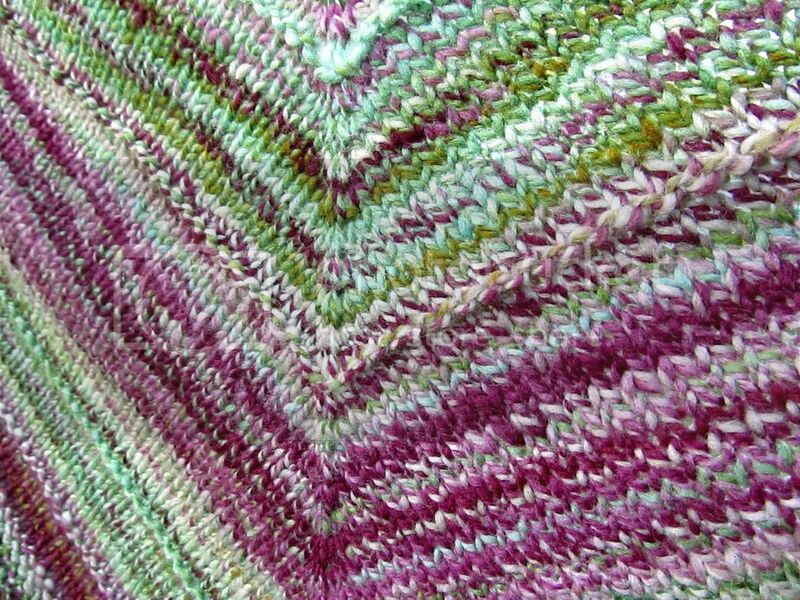 They sort of disappear in the stripes of this yarn, anyway, so I just added one every so often. Also, the garter section at the bottom isn't as wide as the pattern says. I knitted until I ran out of yarn...actually I ran out too soon, with about 20 stitches left to bind off (another surprise, ha! ), so I had to rip back a row and then bind off. Despite that, this was such an enjoyable project. Day 12: I wore a Renfrew shirt that I made earlier this year. The fabric is just some teal jersey with little white arrow designs (bought at Hobby Lobby). There's also a brooch that says "Read More Books" (from this shop, but I think they've been discontinued). Day 13: A short sleeved Renfrew sewn from the same fabric as this one. Day 15: I wore my red socks again, plus this shirt, which got worn around the house a couple more times this week. Day 18: I didn't make the dress that I wore to church (though I've had it for years and it's one of my favorites). But I did wear my Miette sweater and my red Multnomah shawl. Pictured above are some of my favorites. In the top left corner is my first swing dress. I made it in 2011, and it's definitely one of my favorite and most worn dresses. At the time, it was also my proudest accomplishment...the first time I made a muslin and made an effort to get the perfect fit, and my first time altering a pattern. 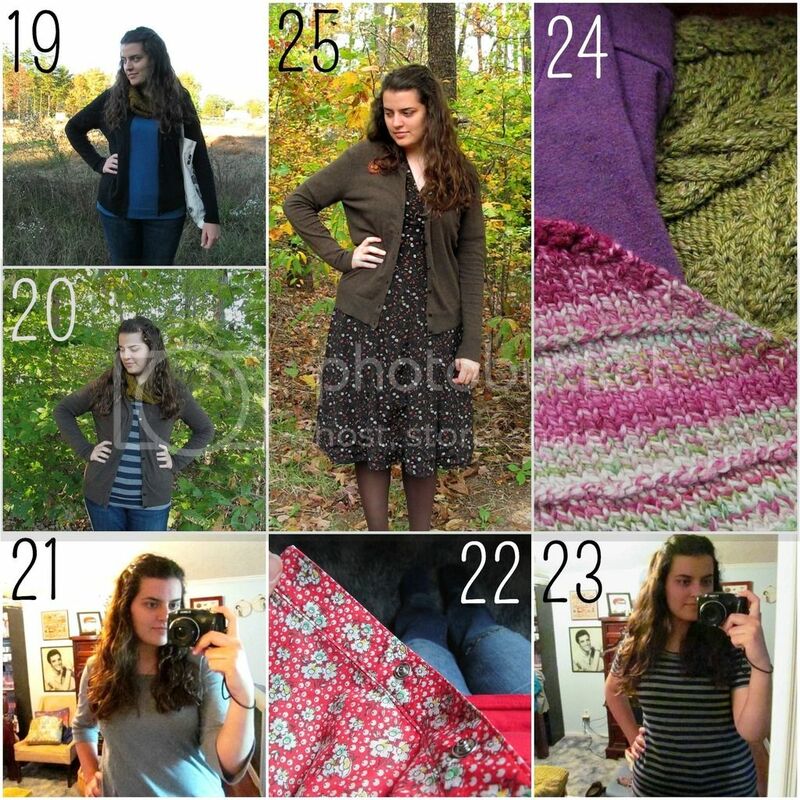 In the upper right corner is the second skirt I ever made, so it's at least six years old...maybe seven? I love this skirt and still wear it to church at least once a month. :) The hem is coming loose in spots, I didn't finish the seams (I didn't really know what I was doing) and there's a small stain on the teal band, but I love wearing this skirt with black tights and a black sweater. Below it is one of my first few Renfrew t-shirts, and my first experience with matching stripes. I wore that one so often that I bought more of the fabric and made a short-sleeved version, too. 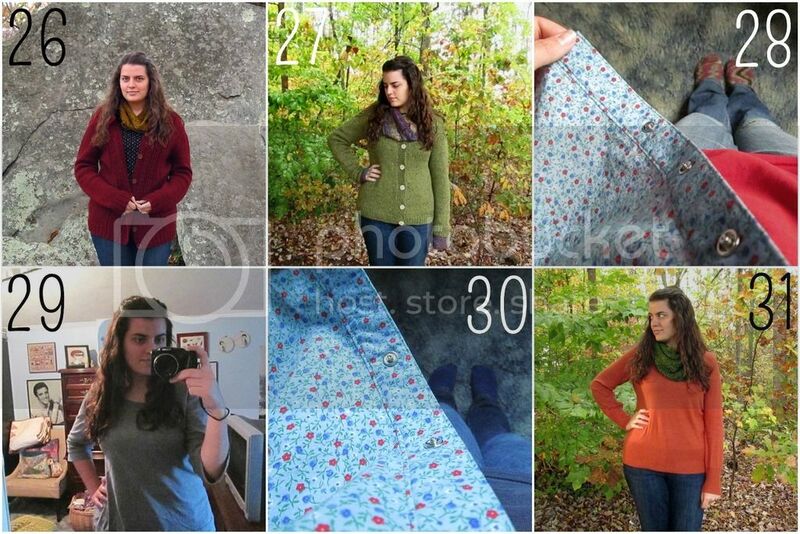 On sewing blogs, you hear a lot of talk about "TNT patterns," or tried and true patterns. I'd like to have a handful of those, but so far I only have two patterns that I've made multiple times and really love. 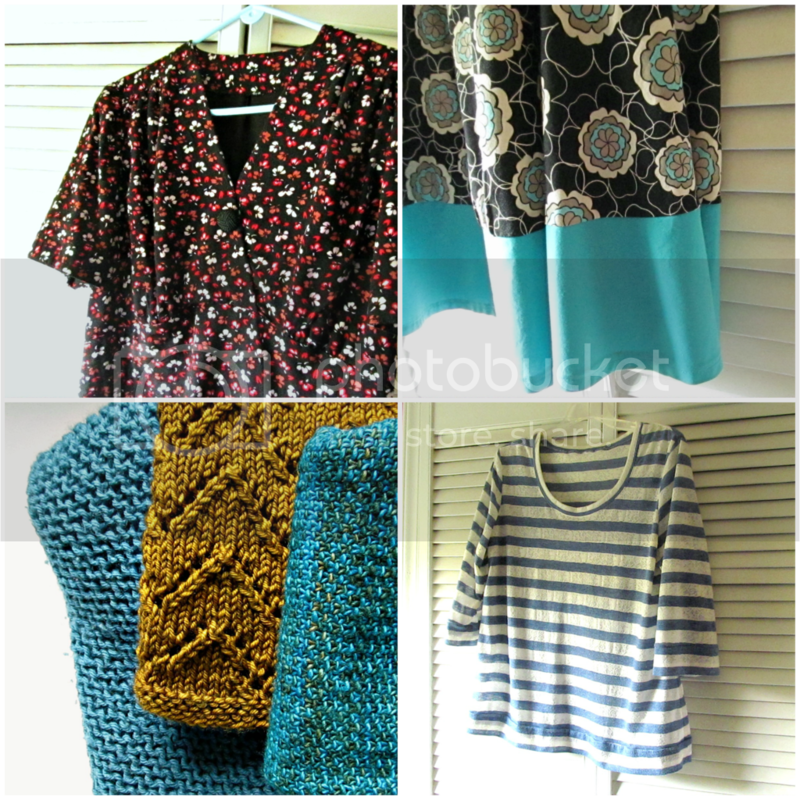 The first is the Renfrew t-shirt from Sewaholic Patterns. Since my first Renfrew almost three years ago, I've made 15 of them in total...short sleeved, long sleeved, mid-length sleeved, pajama shirts, etc. 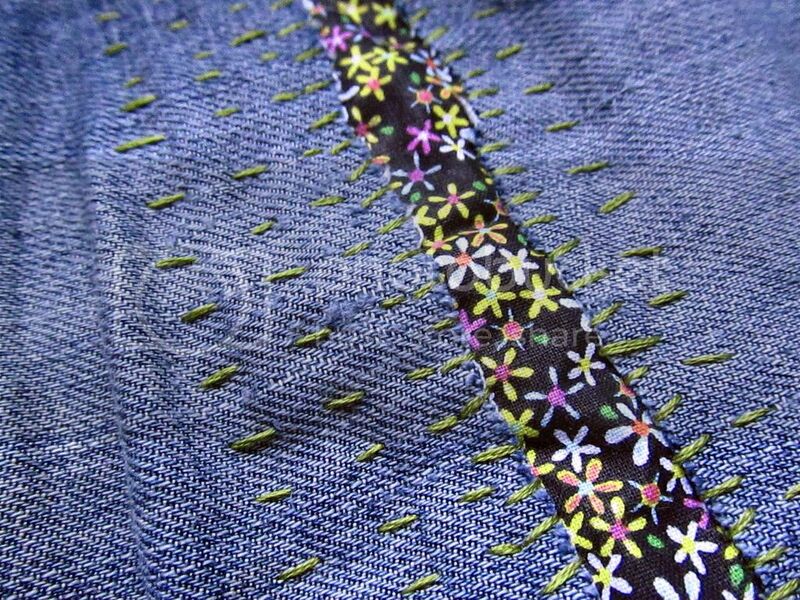 I wear a lot of t-shirts, and it's been great to be able to sew my own as they need replacing rather than buying them! And as someone who hates transferring a lot of markings to fabric while sewing, the Renfrew pattern has spoiled me to an easy and quick (no markings!) sewing experience. It's the only thing I can sew in just several hours. 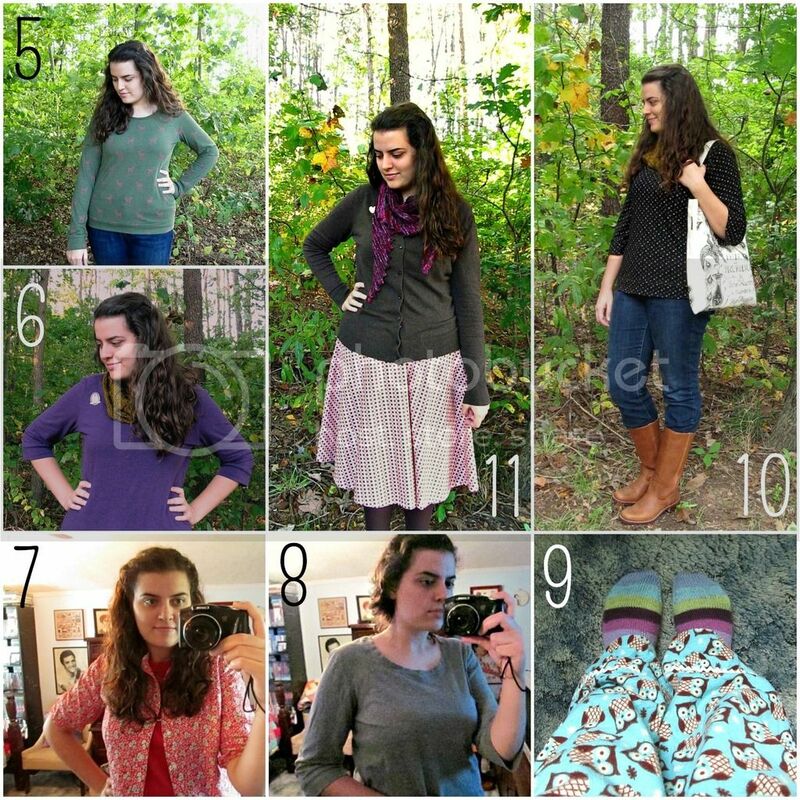 My other favorite pattern is McCall's M5431. It's exactly what I want in a skirt: knee length and really full without having pleats or gathers. 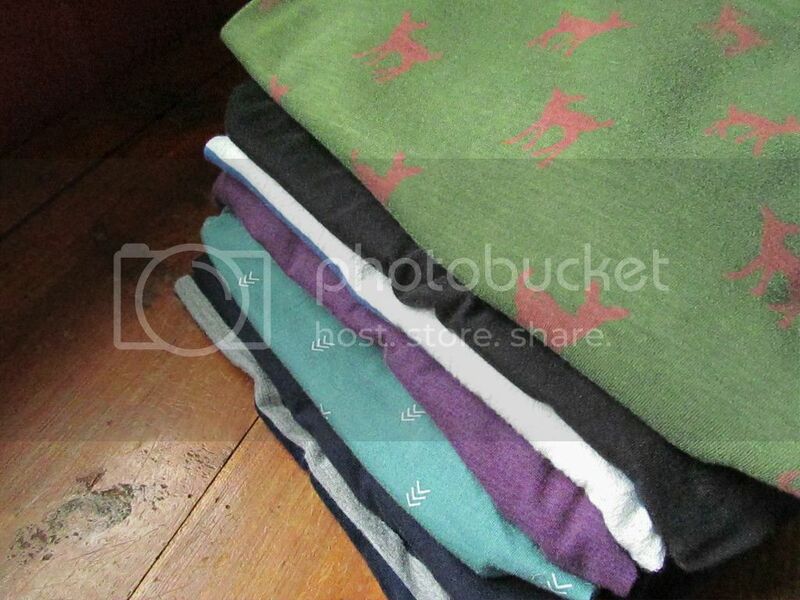 I've made 4 or 5 of them, including the black and teal skirt shown above. When I started thinking about investment pieces, I realize that I only have one so far. I recently bought my first pair of real shoes. My dad has been preaching quality shoes to me and Mom for years, and I'm finally getting it. :) Up until this point, I had never paid more than $25 for shoes...I bought cheap shoes at Payless, wore them until they fell apart, and then repeated the process. In the past year or so, I realized that having an ethically sourced wardrobe included shoes, too, and I started doing some research for shoes made in America. Talk about sticker shock, and a lack of options! Even though I've never been a shoe person, I fell in love with a pair of Frye boots and decided to start saving up for them. (A lot of their shoes aren't made in America anymore, but some are.) Then, over Labor Day weekend, Frye was having a sale, and I got these boots for about $120 less than what I was planning on spending. (They're identical to the ones I picked out originally except the leather is a bit lighter and they have a rubber outer sole instead of just leather. You can see them worn here.) They only had one pair left in my size...I couldn't pass them up. I've only been able to wear them twice so far, but I love them. Over the next couple of years, I'm hoping to gradually replace my worn, cheap shoes with a few pairs of good quality ones. I love the idea of having leather shoes that will last for years and years, that can be resoled and repaired when necessary instead of being thrown away. I'm thinking about saving up for a pair of these next to replace my flats...I waver between thinking that they're pretty cute and that they're rather ugly, ha. Either way, I love the idea of them. You can read this week's post by Karen at the Fringe Association, or follow along on Instagram here. Day 5: I wore my new favorite Renfrew t-shirt, which I made a couple of weeks ago. The fabric is a knit from Girl Charlee, and it was made in America. I really love that little deer print! I've been taking in a little at the side seams on my Renfrews lately, but it wouldn't have been necessary with this one, since the fabric has less stretch. It's a bit snug across the shoulders now. Day 6: Another Renfrew. (This is definitely going to be a trend this month...I've sewn a lot of them and I wear them all the time.) 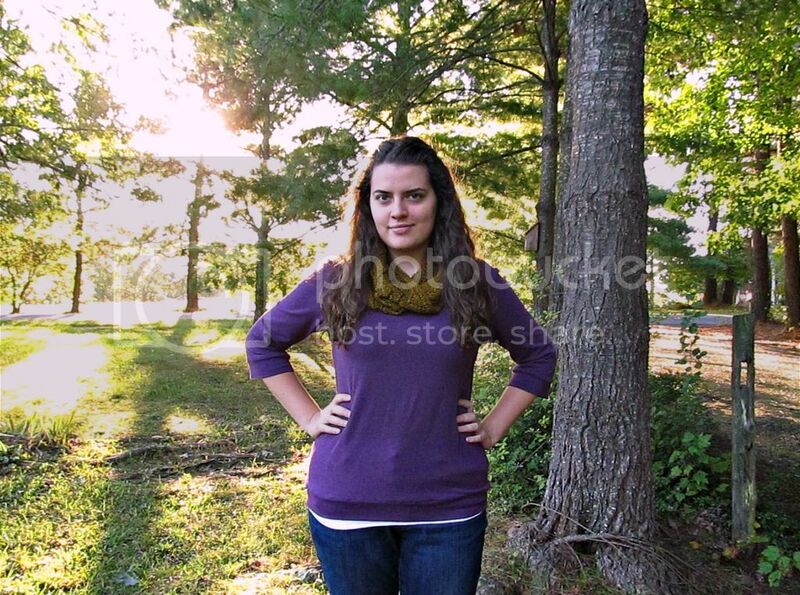 This one is another favorite, because I love purple. The fabric also came from Girl Charlee (I can't find it on there now, but I think it was made in the US, too?). 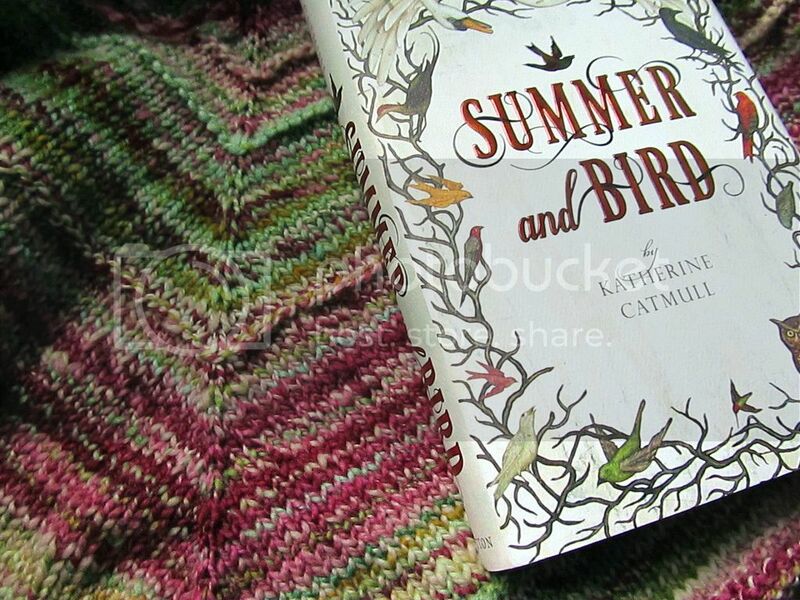 I also wore a knitted cowl and a little bookworm brooch (handmade, but not by me). Day 7: On Wednesday, I wore this red shirt that I made back in 2012. The shirt was cute enough, but the fabric was a really bad choice. It was 100% polyester and it stained everything red (my white cami underneath, my tote bag, etc. 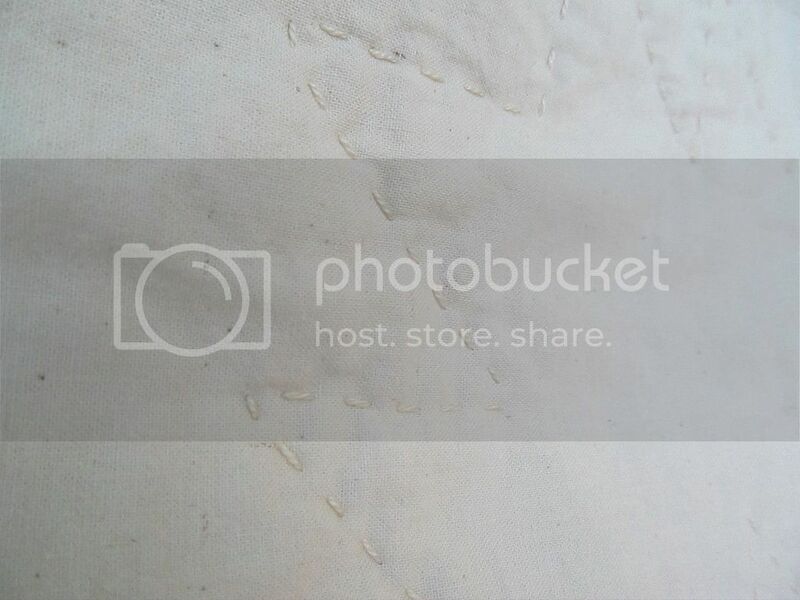 ), and the fabric was so thin that the seams are weak. Anyway, I still wear it around the house sometimes. Day 8: Really bad photo, sorry! This was the first Renfrew shirt that I ever made, back at the beginning of 2013. It's a bit stretched out now, so I only wear it while babysitting or around the house. Day 9: On Friday night, I wore these flannel pajama bottoms (owl flannel bought at Joann's last year, made in China, I'm sure...vintage white rickrack) and my most recent pair of knitted socks. Day 10: I wore my black polka dot Renfrew and my knitted Downton Cowl. 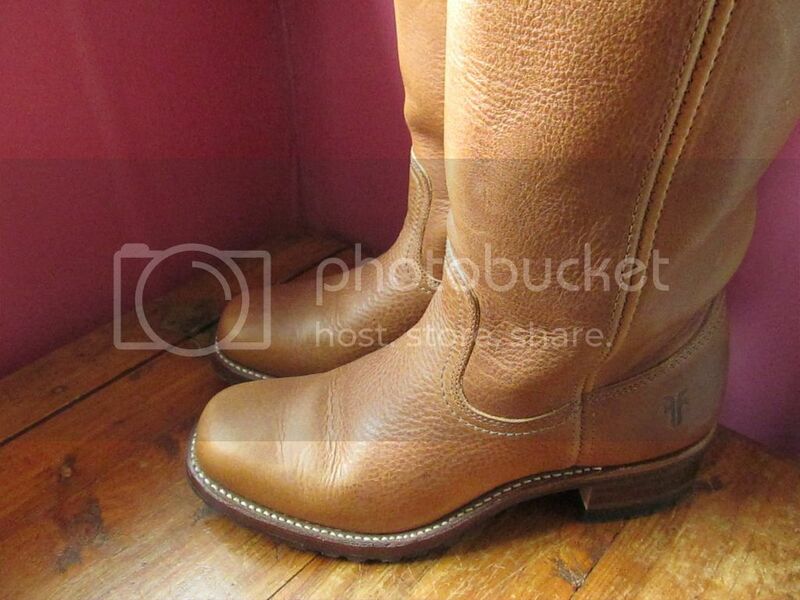 Also, my new Frye boots! They're 100% leather (besides the rubber outer sole) and made in America, but more on those next week. :) And that's my most favorite tote bag ever. It's the Pride and Prejudice one from Out of Print Clothing (bonus: made in America). I've basically been carrying that bag for the last three years...this is my second one, because the first got so worn out and stained. I do occasionally switch it out with this tote bag, which is also made here in the US. I'm a monogamous knitter...having too many projects going at once stresses me out. 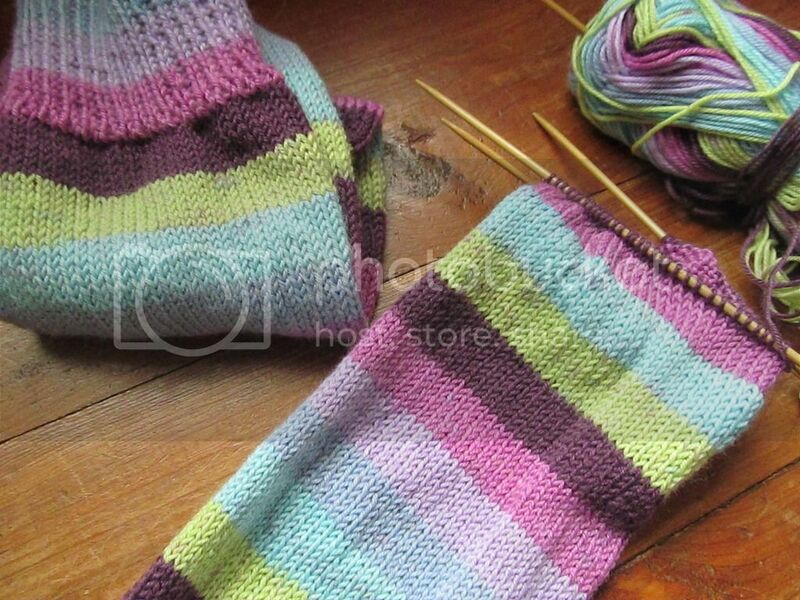 I usually have two works in progress at any time: a pair of socks and something else. But for some reason, over the past week or so I've just been wanting to cast on everything. I'll have to start Christmas knitting soon (should have already started, honestly), but somehow all of my new projects are for myself. Oops. Since I finished my wizard stripes socks, I went ahead and started a new pair. This yarn feels so fall-ish to me...it's a speckled yarn from Spun Right Round. I'm doing another pair of Hermione's Everyday Socks. 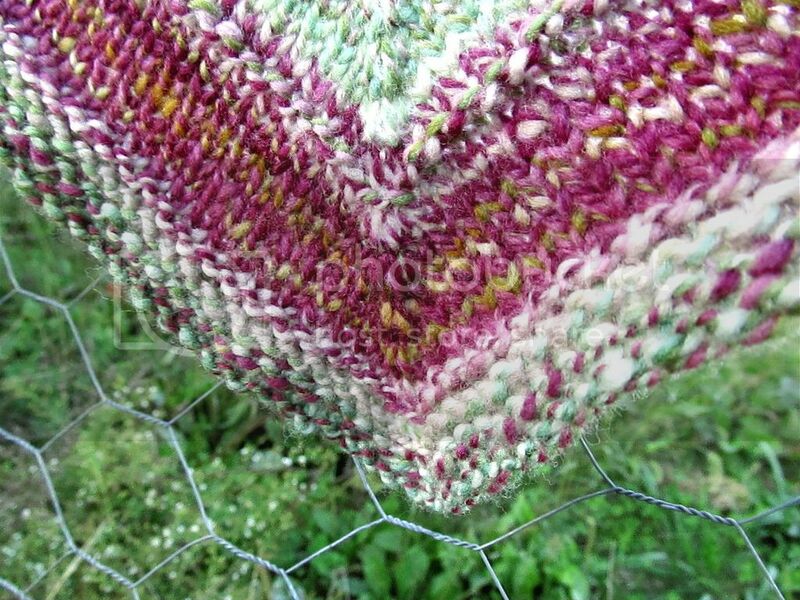 I love how just a few purl stitches can add so much texture! As I've mentioned, I also started a hat, FreshMint, using some marigold-dyed yarn from Liesl at Buckaloo View that I won in a giveaway earlier this year. The hat was turning out too large (I have a big head, so I don't know why this has been happening to me lately! ), so I decided to rip it out and start over. 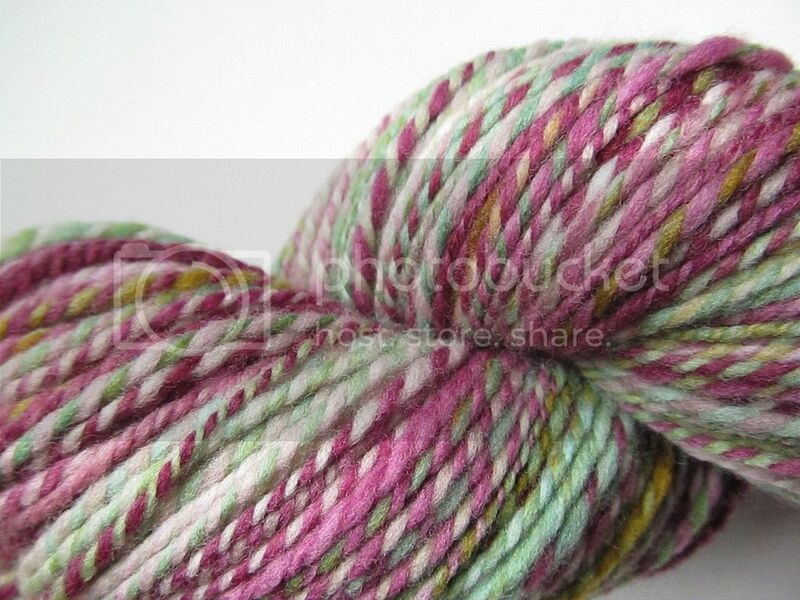 Well, I haven't cast on again yet, because I got distracted by my new handspun yarn. It's always frustrating to have to rip out a knitting project, so I convinced myself that it would be okay to step away from the hat for a while and cast on a shawl from my handspun. Another pair of socks finished! I've been knitting these off and on since July...no hurry, just a few rows here and there amongst all of the craft fair knitting. I actually finished most of the second sock in the past week. There's not much to say about them. 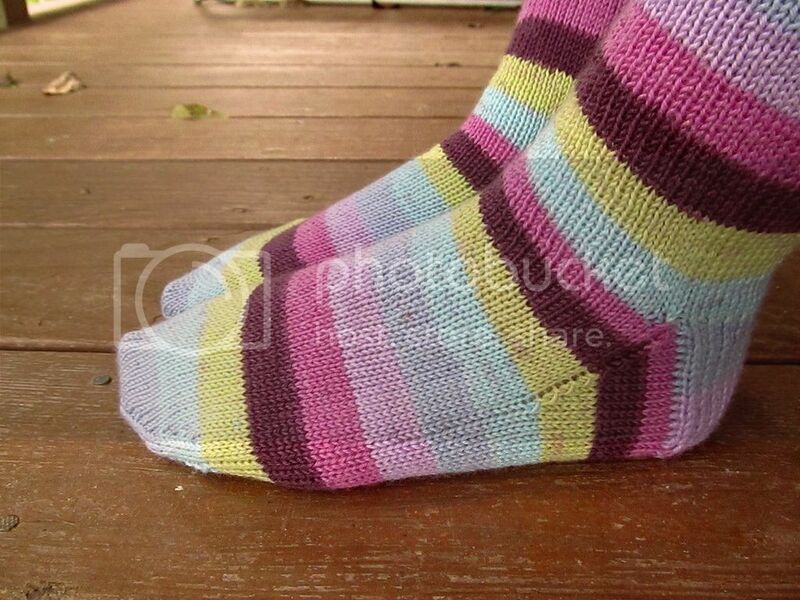 They're plain vanilla socks made a bit more exciting because of the stripes. :) The yarn is Felici by KnitPicks, in the Wizard colorway, and even though the colors are a bit more pastel than I normally go for, they've grown on me. Felici is really affordable as far as self-striping yarn goes...I did notice that with this batch there were a lot of splotches, especially purple on the yellow-ish green sections. It's not a big deal (you can barely see it in the photos), but it does make the socks look a little dirty even though they haven't been worn yet. 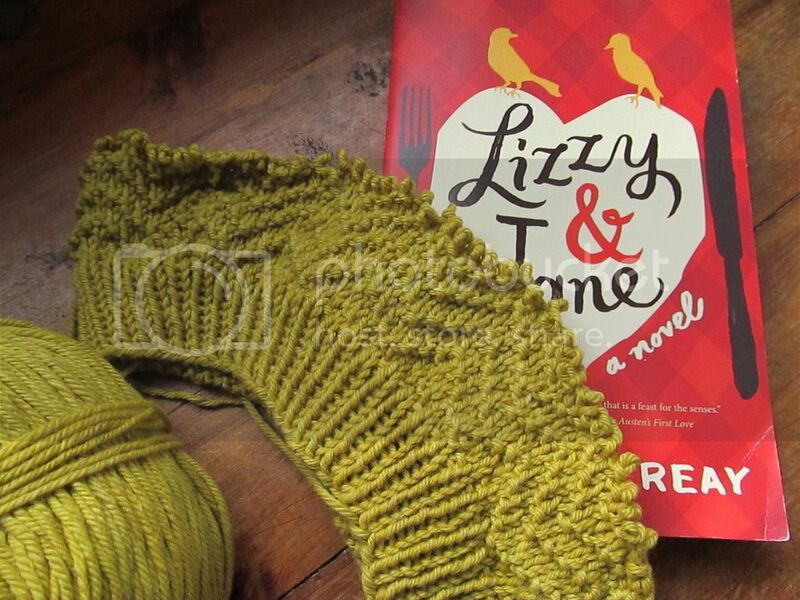 Reading: I haven't done a lot of reading over the past week, so I'm still working through Lizzy & Jane, by Katherine Reay. I'm really enjoying it! There's been a lot of discussion on sewing blogs over the past couple of years about having a "uniform." At first that idea sounded really restricting, but when I thought about what I wear on a regular basis, I do have a uniform. All summer long, I wear a t-shirt, jeans, and flats. (I don't wear shorts or sandals. Have I mentioned that summer is not my favorite?) During the winter, I wear a t-shirt layered under a sweater, jeans, and boots (plus whatever knitted items I can get away with). I do wear dresses and skirts to church, but even then I have a silhouette that I'm drawn to: a more fitted top with a flared skirt. It's even better if all of my clothes are well made from ethically sourced materials...I'm always trying to improve on that, of course. I'm a bargain shopper by nature, so I'm constantly reminding myself that it's better to spend more on materials for a few quality items rather than to make lots of things from cheap materials. Quality over quantity. - Jeans. I'm actually okay with jeans right now...I have two good pairs of them, plus a couple more pairs that I can wear around the house. But the fact is that I wear jeans all the time, and I can't bring myself to buy any more from Old Navy and I can't afford ethically made jeans. So even though I never thought I would do it, I'm going to try to sew jeans. I bought the Ginger Jeans pattern a while back when it was on sale, so now all I have to do is get some supplies and print/assemble the pattern (to make things a bit more interesting, our printer isn't working). Oh, and gather my courage because the thought of sewing jeans is so intimidating to me. - The perfect dress. I still haven't found the perfect dress pattern. I love my swing dresses, but I don't want to wear that style all the time. I like my Hawthorn, but the neckline is too big and I'm not too sure about the collar. I want a fitted bodice (comfortable but not frumpy), a full skirt (but no pleats or gathers), and short sleeves (so I can wear it during the summer and under a sweater in the winter). - Shoes. I'm going to write more about this later on in the month, but all of my shoes are cheap (think $20 or less) and I've been wearing most of them for at least five years...needless to say, they all started looking ragged around the same time. Replacing my shoes is definitely going to be a slow process, though, because of the cost of quality ones. I'd love to hear any of your thoughts on this subject! And of course you can follow along with all of the Slow Fashion October happenings over at Fringe Association. I'm a little obsessed with this yarn. 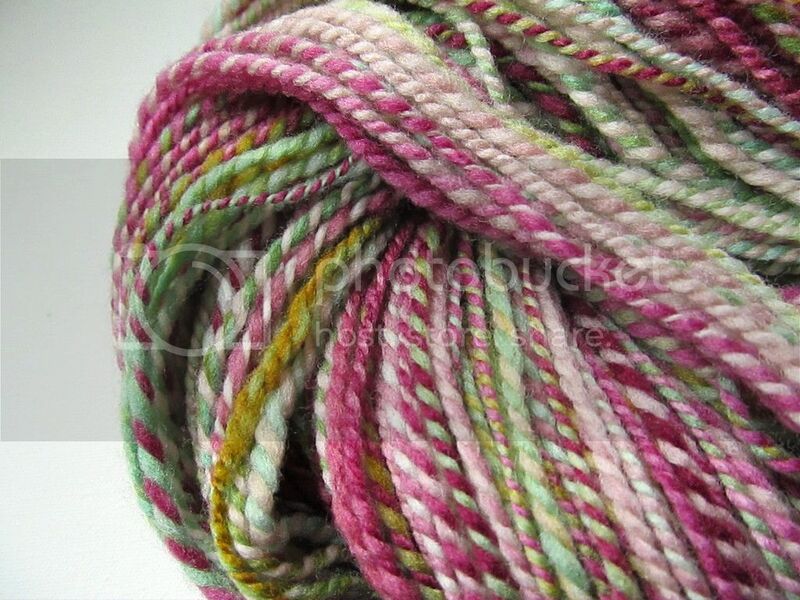 :) I bought 4 ounces of Merino top last year, in the Rewind colorway, dyed by Renee at Spun Right Round. 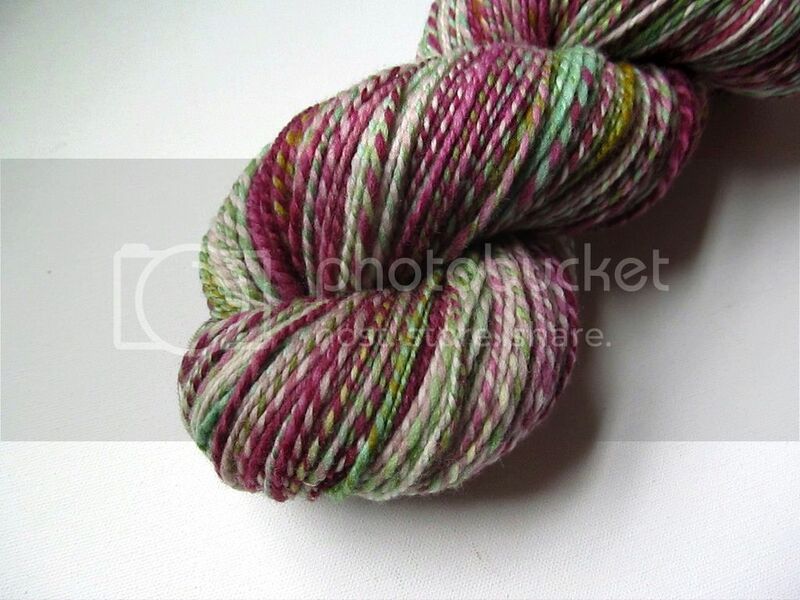 As I was spinning through a lot of my fiber stash earlier this year (most of it spun into yarn for the shop), I held on to this one because I knew I wanted to spin it for myself. Day 2: Not going to lie...I basically spent all day in my pajamas on Friday. I thought I would be rushing around that day, getting ready for my first craft fair of the season on Saturday, but it was postponed until later in the month because of this crazy rain and wind. Thank goodness, because it would have been miserable yesterday! (Though I now have festivals two Saturdays in a row.) So I spent the day spinning and knitting in my pajamas. Those are my New Year's socks and I made the pajama pants made out of cute crafty-themed flannel. Day 4: Wow, I'm finally wearing real clothes! :) Today to church I wore my first swing dress, which I made back in 2011. That's one of my sewn garments that has held up really well and that I still love to wear. I also wore my red Multnomah shawl that I finished earlier this year. I really need to knit a lightweight cardigan to replace this one...I bought it at Target about four years ago and it's pretty faded. 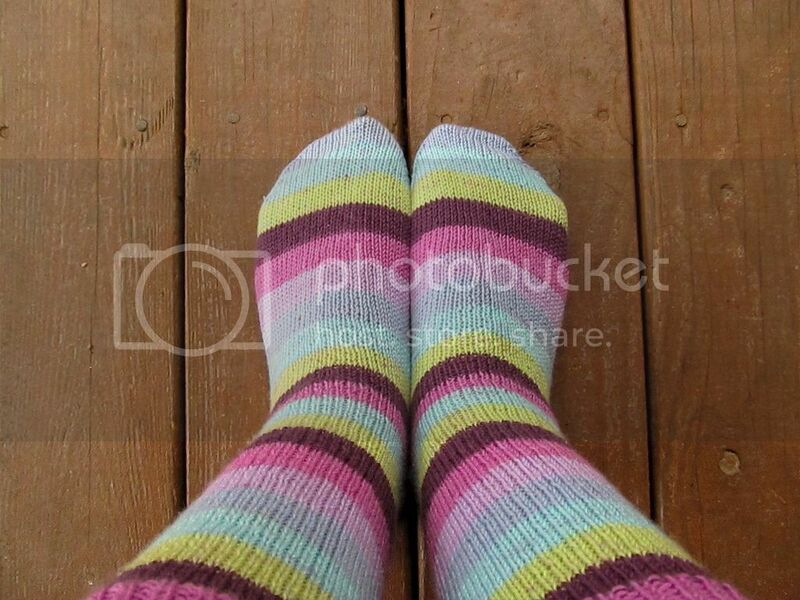 Socks are the one thing I never feel guilty about knitting. 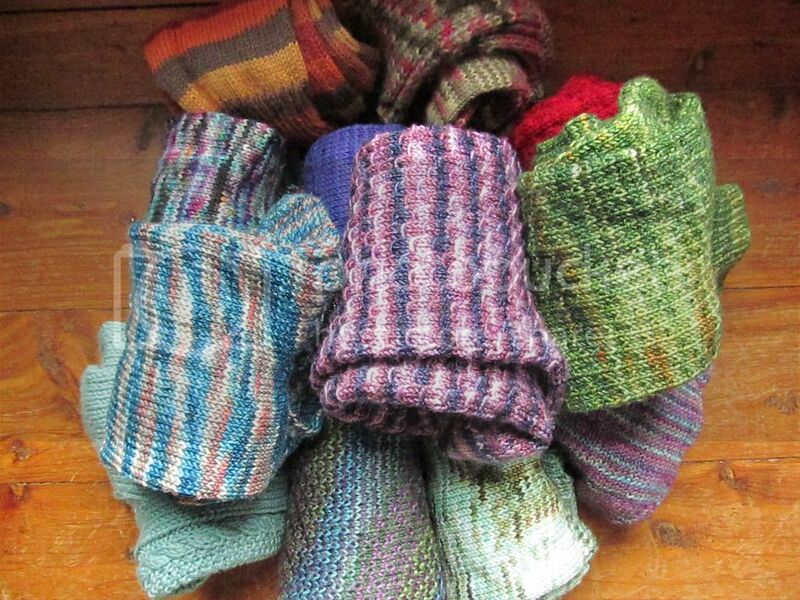 It's possible to have too many scarves or shawls or fingerless gloves or even sweaters (unless you live in an incredibly cold environment, which I don't), but socks? 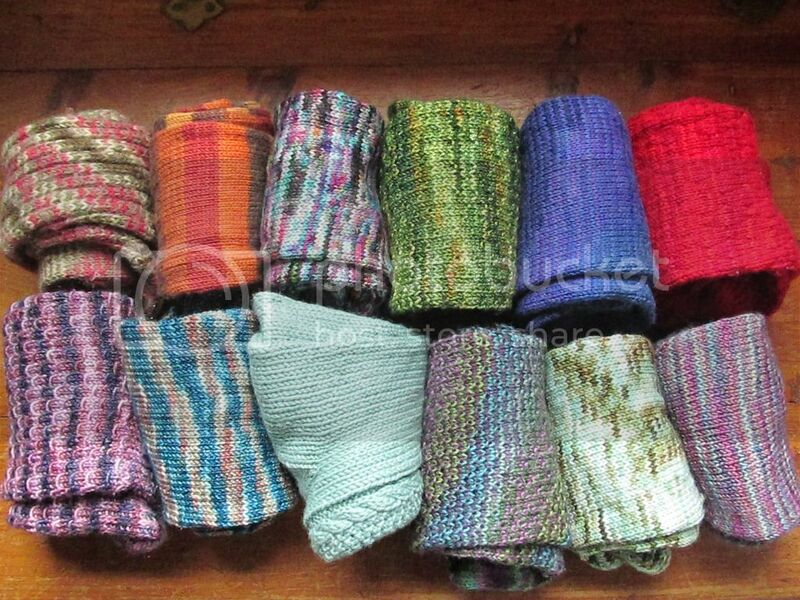 They get more wear than any other handknits, so it makes sense to have a decent supply of them on hand. I've knitted a lot of socks this year (seven pairs so far, with another nearly done), and it's been so satisfying watching my drawer fill up. I have thirteen pairs at the moment, with plans for more. These are still my favorites, closely followed by these. My least favorite pair is my first pair, because wow...that yarn was ugly. So far those are the only ones I've had to darn, probably because I knitted them on larger needles and I guess the fabric isn't as dense. 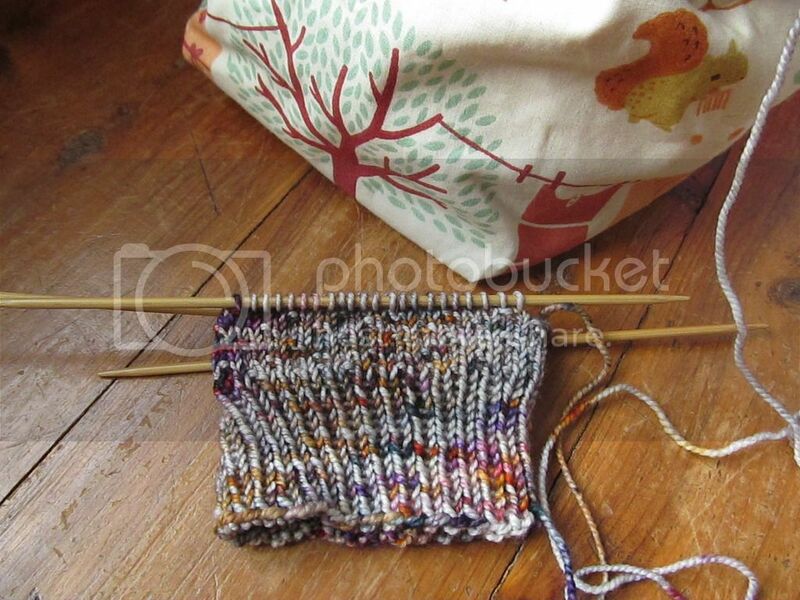 I already caked up two autumn-ish yarns from my stash to hopefully knit into socks this fall. I think the speckled yarn will be Hermione's Everyday Socks, and I haven't decided on the tweed, though I'm thinking something with cables? 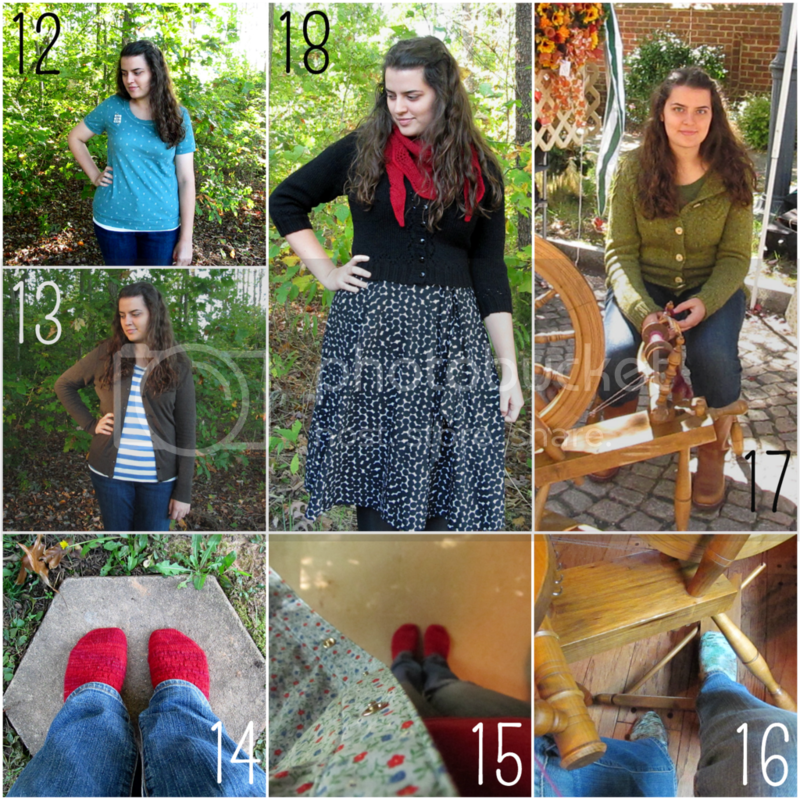 *While writing this post, I noticed that these pictures didn't include my handspun socks. I may have had a tiny freak-out because I couldn't find them in my drawer, either. I don't lose things, and those socks represent hours and hours of my life! I finally found them stuffed down in a pocket of my knitting bag, left there from when I'd worn them to my grandparents' house sometime in the spring.